Packing for a four day trip to Phoenix. Two travel days, two days of meetings. Day time temps will be 95-102, night time temps in the low 60s, and the temperature indoors may be in the high 60s. 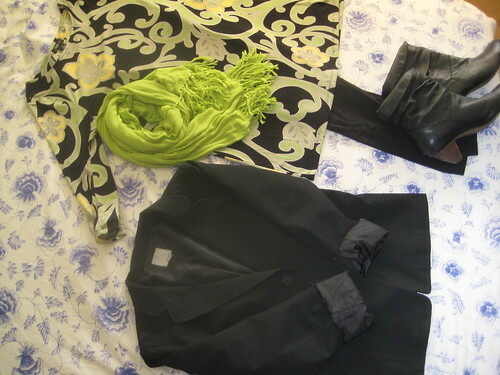 Green tunic, leggings, ankle boots, jacket, scarf. This green scarf is a very stretchy lightweight knit that is almost as large as a pashmina when stretched out, so it can pinch hit as a small blanket. The same tunic, a black stretchy pencil skirt, flats. Black tank top, cropped turquoise sweater (the heaviest thing I am taking), scarf, same skirt, same flats. For the return trip, I’ve got another tunic which I will wear with the leggings, boots and jacket. 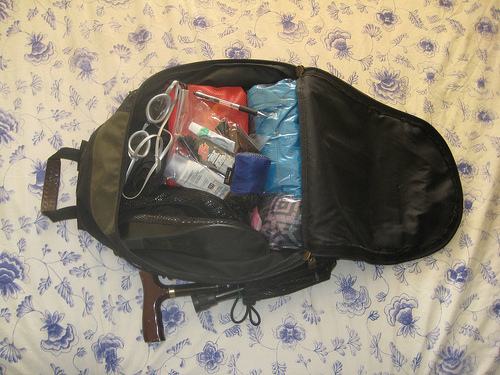 The bag under the wheelchair (purse equivalent) contains wallet, phone, keys, work ID, and will fit into the backpack for boarding the plane. That’s it! THANK YOU for posting this. I stink at packing light, and I have a business trip this summer – first time in 10,000 years I’m going some place not for kids-n-family. Massively helpful. Glad it’s useful! Everything worked out ok, except that my legs/feet swelled up enough on the plane both ways to make getting the ankle boots off a challenge, so I’m re-thinking those. I wore everything I brought, except one of the scarves. awesome – lemme know when you open for packing light business!? Yeah, it’s kind of an obsession…or maybe a competitive sport. Brill, thanks. I pack about five times this to go over on a ferry – I need to think it through and minimize, particularly on the clothing.